In the last decade, dozens of rural maternity wards across Canada have been shut down, forcing expectant mothers to choose between delivering their babies at home, or travelling hours to reach a hospital in a major city centre. The percentage of expectant Canadian mothers who live more than two hours away from a birthing centre is now at 17 per cent. Jude Kornelsen, co-director of the Centre for Rural Health Research at the University of British Colombia, says there are several reasons why rural hospitals and health centres are choosing to close maternity wards, including trouble with retaining staff and the need to cut costs. “We have historically had trouble recruiting and retaining health care professionals in smaller communities for several reasons: lifestyle preferences, the desire to be in a larger centre,” she told CTV’s Canada AM from Salt Spring Island Monday. Doctors and nurses who become trained in obstetrics tend to want to be in higher-volume health centres where they can use their skills and gain experience, she explained. Paying those who are trained in obstetrics and who choose to stay can be expensive, especially in health centres that see only a handful of births a month. 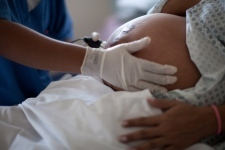 But when maternity wards close, it is expectant mothers who pay the price, says Kornelsen. Many mothers choose to move closer to larger towns before their birth, incurring not only the costs of accommodation and perhaps lost wages, but also the stress of not being near home and family for one of the most important moments of their lives. Then there are the risks of delivering at home. Kornelsen says there is research to show that in B.C., women who live more than one hour away from delivery services experience more bad outcomes. “Those who have to travel two to four hours to access care will have higher rates of — not surprisingly — roadside deliveries. They also have higher rates of admissions to NICU’s,” Kornelsen said. What’s more, the babies born to these women are at higher risk of dying shortly after birth. “Women who have to travel more than four hours have almost three times of perinatal mortality, which is really concerning,” she said. Midwives are playing a growing role in maternal care in rural communities, but Kornelsen says regulated midwifery is a relatively new branch of maternal care. Currently, there are only 1,300 practising midwives in Canada, which is not enough to fill the needs of all rural Canadians. As well, in some areas of the country, midwives aren’t supported as they try to integrate into the traditional health care system, she says. For example, midwifery remains unregulated and unfunded in Newfoundland and Labrador, the Yukon, Prince Edward Island, and New Brunswick. Kornelsen says cuts to maternity wards are really part of a larger problem that is resulting in more and more rural areas losing access to quality health care. It’s is not just happening across Canada, she says, but in rural areas of the U.S., Australia, and elsewhere, and it signals a larger shift. “This issue of a reduction in maternity services can be described as a canary in the coal mine of rural health care,” she says. She says the cuts are a signal that rural health care needs more attention. She adds that those living in rural areas need to do more to make their voices heard, to fight to stop cuts, and to offer solutions that will allow their health services to be protected. “We’ve really over the last few decades, lost the power of community voice, in planning health care and expressing what the community wants,” she says.